PENDLE SALE SAVE UP TO 25% ON GOALKEEPER GLOVES ONLY WHILST STOCKS LAST! Pendle’s goalkeeper gloves offer superb value for money and because the factories manufacture to our specifications, the price you pay will be somewhere around half the price of goalkeeper gloves offered by large global brands. We offer two distinct gloves, both of which offer a top-quality glove for the various standards and age of an individual player. 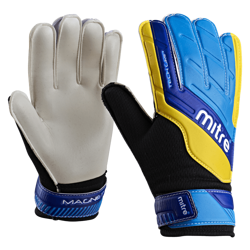 Our Aspire goalkeeper gloves are available in both a Boys size 5 (recommended for 9 -11-year olds) and a Youths size 7 (recommended for 12-14 year olds) and are magnificently constructed offering breathability to the finger and thumb areas along with superb cushioning protection to the palm and front of the hand. It is a top-quality flat palm goalkeeper glove which will offer years of use if cared for properly. We believe that at this price offers arguably the best value for money in the market place. We also have our Aspire Pro. The Pro is our top-quality goalkeeper glove available for adults only in a size 9. Again, breathability and cushioning protection are a key feature, but the added benefit of the Aspire Pro is the roll finger glove, which helps with gripping and controlling the ball. It is a professional quality glove sold at an unbelievable price. Choose from one of our two ranges below and get yourself a fantastic deal.